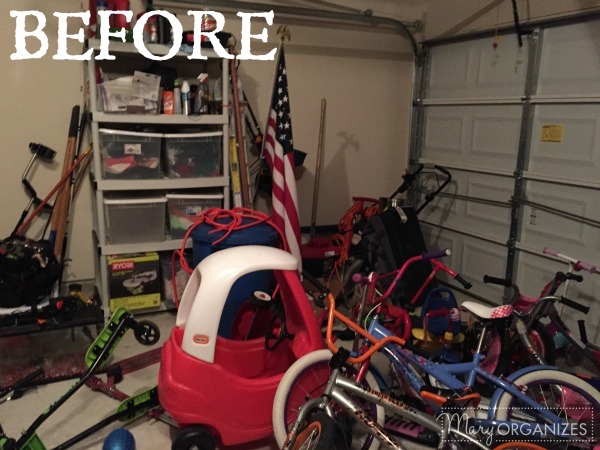 Remember the contest for Mom’s messiest room makeover? 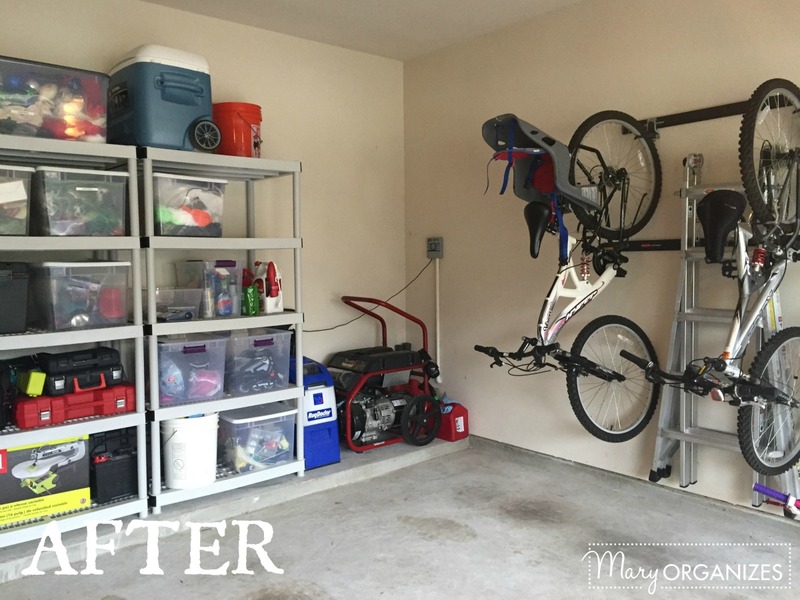 This past weekend I traveled to the winner’s home to give her garage some organizing love. I admit to feeling a little outside my comfort zone to take two flights to a place I’ve never been to organize a garage I’ve never seen with people I’ve never met. Of course, all of my nervousness was unnecessary. 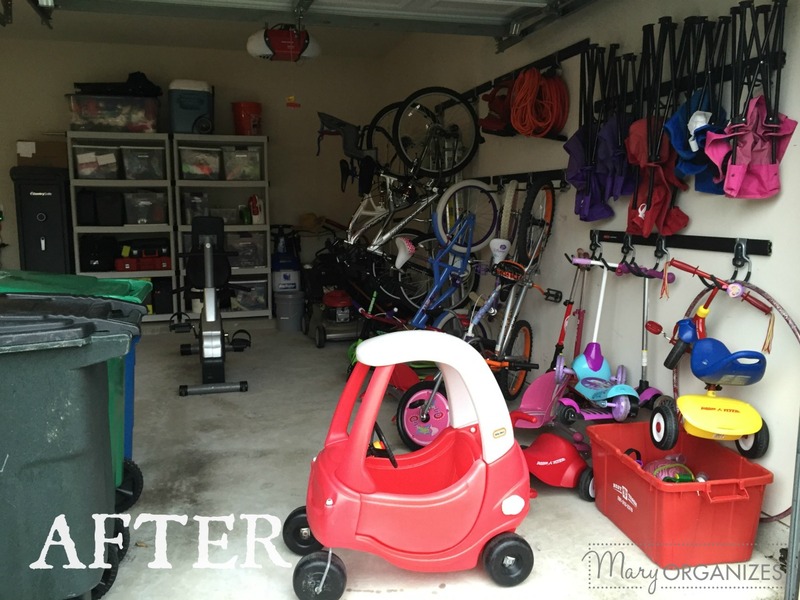 As soon as I was in that garage making a plan to get it organized, I felt right in my happy place. Saturday morning I got up extra early to stop by the store on my way. 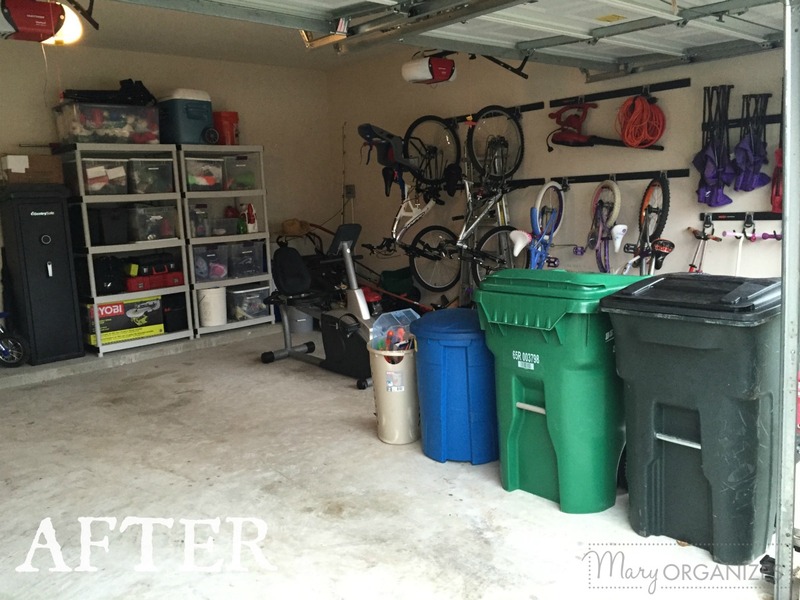 When I arrived, Maureen from Katy Home Organizer had already begun to pull things around and give us room to work. 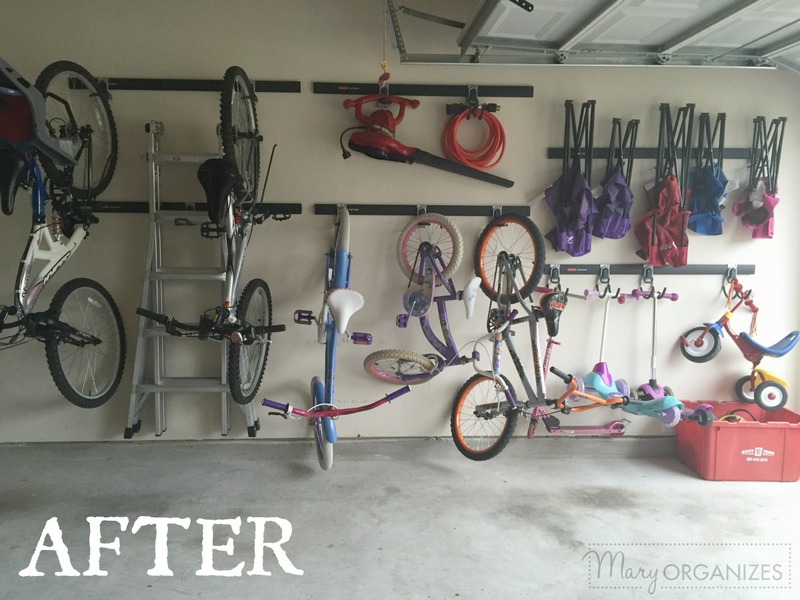 The first thing we did was pull things away from the right side wall so that we could install a FastTrack system to get the bikes, scooters, ladders, camp chairs, and more up off the floor. Here is Maureen drilling in the back anchor to the FastTrack. We made sure to only drill into studs so that the tracks could withstand the weight of all the things we want to hang on it. Maureen was so much fun to work with and after seeing her in action, I would definitely recommend her to anyone local! Installing all the FastTracks took a bit of time, but it was so worth it to give all of this stuff an organized place to go. Once the tracks were up, we put the two pre-existing shelves together that were separated. 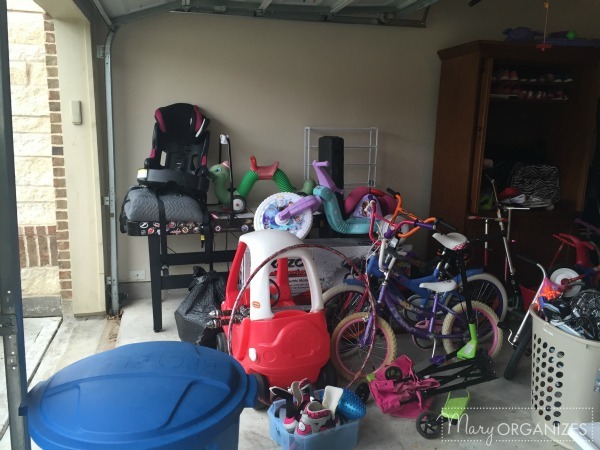 Then we sorted through all the remaining stuff in the garage to get it sorted onto the shelf. While Maureen and I were busy organizing, the winner took the time to take pictures of all these things in the donate pile. Throughout the day she would post things to local friends and family on Facebook or by email and people would come pickup the things right away. It was amazing to watch this pile dwindle throughout the day. 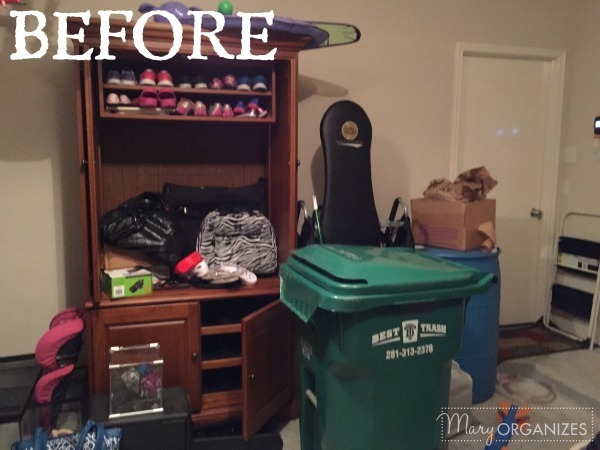 Social media can make decluttering easy! That huge entertainment center was so heavy, and we didn’t have to move it at all and we just watched as the new owners hauled it away. 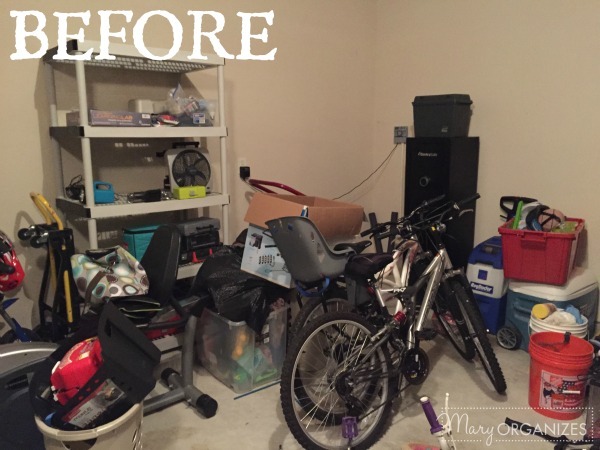 It was important to do this decluttering while the momentum was strong! Don’t you think this wall turned out great?! And look at this shelf?!! This view just makes me happy! 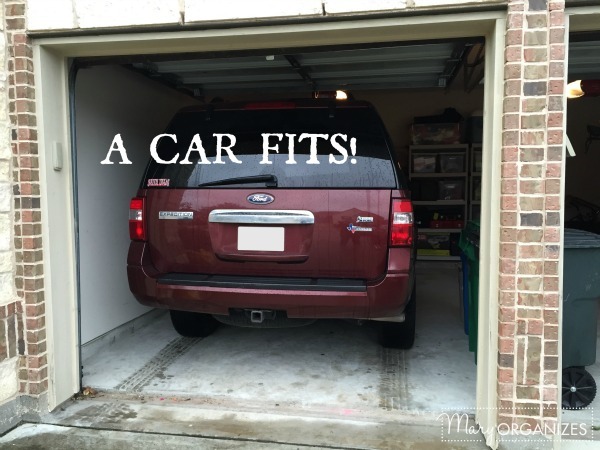 When I discussed the goals with the winner, we agreed that the goal was to fit one vehicle in the garage and use the other side for the equipment. Our last step was adding back in all the stuff that didn’t go on the shelves or wall. From this angle you can see the right side of the garage as it will stay. I think the difference is phenomenal for one big Saturday!! And then the true victory – the car goes in! 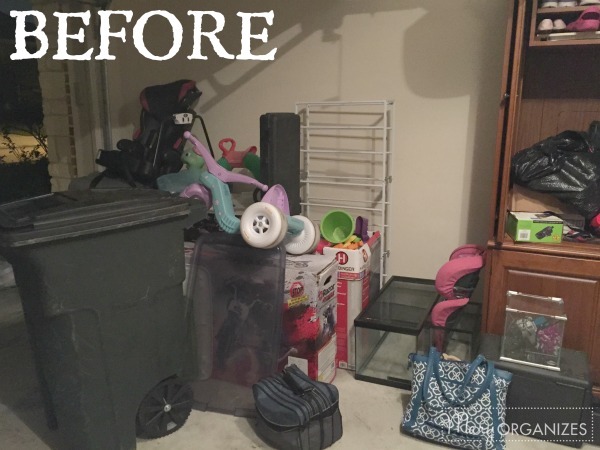 Decluttering is definitely the first step to take! You can do this! Go for it! Congratulations winner, Mary and assistants!! 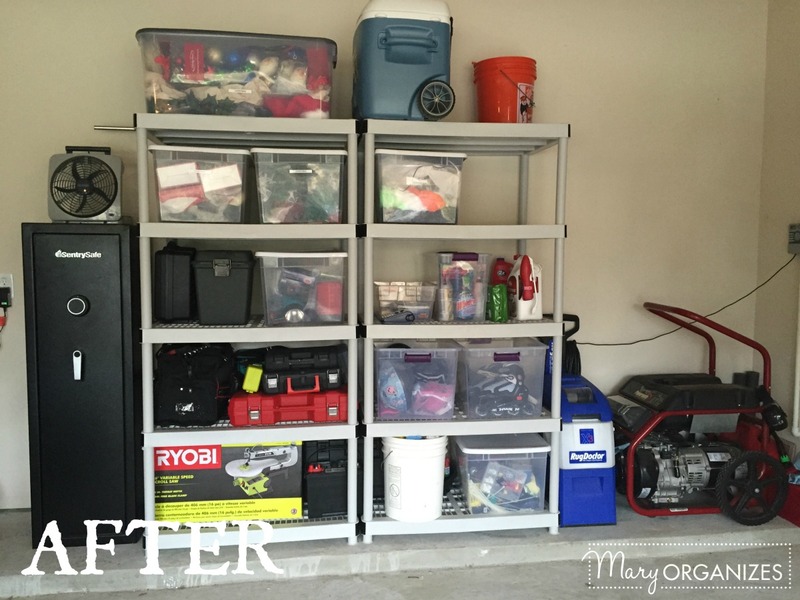 Amazing job of organizing and I am slightly jealous but encouraged that the same could happen at my home. So proud! Thank you! And yes, you could totally do this!! We are downsizing hoping to move to a retirement village and your site is so timely. Just thinking about this makes me immoble. Thank you for giving me energy and ideas….and a deadline! Take it day by day, really. You can totally do this!